Our Daily Bread Designs is celebrating their 8th Anniversary this week, and today kicks off a week long celebration of Blog Hops, Challenges and New Stamps and Custom Dies! 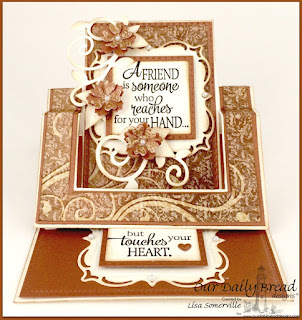 Today, I'm joining some of the other ODBD Design Team members in sharing cards created with a Bronze theme to celebrate Our Daily Bread Designs 8th Anniversary! Continue reading below to find out how you can win one of three $15 Gift Certificates to the ODBD Store! I created a Swing Easel A2 card, using a quote from the Quote Collection 4 stamp set. I used the Omitting Technique so that I could stamp part of the quote on the top part of the card the the remaining part of the quote on the inside. After stamping the quote on Vanilla card stock, I die cut each part using the Squares die set, layering the stamped panel on a Bronze panel that was die cut using the Double Stitched Squares, then layering on a Vanilla panel that was die cut using the Lacey Layered Squares die set. I embellished the card using the Foliage and Leaves and Bitty Blossoms die sets. The beautiful papers are from the Winter 2014 Collection paper pad. Additional ODBD dies are listed below. Three randomly selected winners will each receive a $15 gift certificate to the ODBD Store just for commenting on the Design Team cards! You have until March 16, 2016 at 9:00 p.m. EDT to leave your comments on the Designers Blogs for a chance to win! The Winners will be posted on the ODBD Blog on March 24th, so be sure to check back there to see if you won! I love your card, Lisa. Lots of layers and detail. I like the neutral colors. Wow! Loves how u have the card folded. The sentiment is perfect. .and the Bronze color is gorgeous! happy anniversary to ODBD. wow your card is really gorgeous. i love step cards and this is a beauty. this is so wonderful. so many layers and just pretty. awesome. Wow, what a great combination of stepcard and easel card!! I LOVE this! Lovely layout and design as well and i love your flourishes and flowers! Beautiful job! Love this design. Beautiful card! I love the folds. Great job! What a gorgeous easel card. I love the sentiments and your design makes it possible to look all day! Lots of lovely layers on this card and I like the easel card creation - the colors are so beautiful - everyone has done a magnificent job! TFS and for the hop! The paper is elegant and the card simple to make. Together, they make a terrific card to receive. What a beautiful, classy card! what a great fancy fold! love it! LOVE your card!! I haven't mastered the stand-up thing yet but you've inspired me to try it. Peggy Edens. Amazing and stunning card. Love every aspect of it. Beautiful! Now I must learn more about the swing easel! TFS! wonderful folds on this beautifully designed card. LOVE this fancy fold! Gorgeous card, Lisa!! Hi Lisa, I'm really lovin this card. Ingenious design. All the Bronze layers are Beautiful. Fantastic design. Excellant work. What a beautiful card and layout! Such a beautiful easel card!! Love the sentiment!! The layers are fantastic!! Gorgeous card and I like the fancy fold you used. Beautiful card and someone is very blessed to receive this! Oh my goodness! Lisa this is STUNNING!!! WOW!! Interactive cards are my favorite and my specialty. LOVE THEM! So I adore your easel card. The brown tones are ideal for this card and gotta love the flourishes. WOW! This is a beautiful card. Love that is stands up. Wow! a lot of work and a stunning payoff! What a wonderful Elaborate card. Hope I can duplicate this one, without it taking 16 hours to do it. Have the dies, just need to get started. Thinking of using for Mother's Day, in Lavender or Blue tones. Thank you so much for your creative inspiration. Your card is so gorgeous! I can't imagine how much time you put in to create it. I've been meaning to make one of these swing easels. This is a good reminder to give it a try. Gorgeous card with fabulous details! Such a gorgeous easel card! Your card is so cool! Love the neutral color palette, and the design. Tfs!